Hi Everyone!! 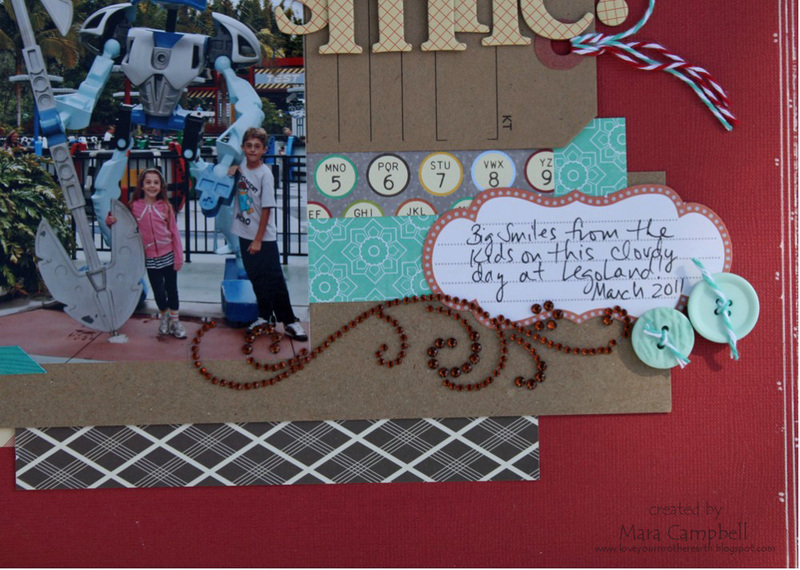 I have a preview today of one of the *new* templates Lauren is releasing this month with My Time Made Easy. I think you are going to love this one! Really, how awesome is this template?? It's a cute little camper, complete with doors and windows and a tow hitch! There are so many details that are included with this template. 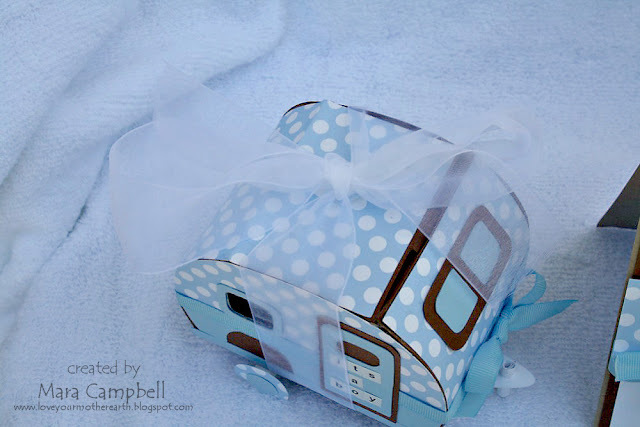 You can give your camper a striped awning or curtains in the windows. 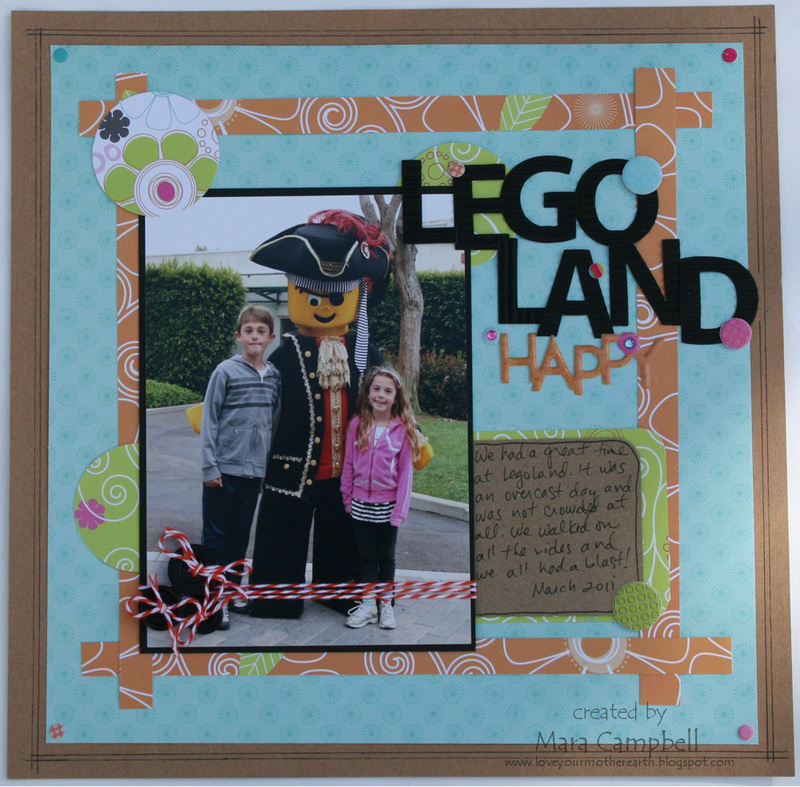 There are so many fun components you can use to personalize this one. When I saw this template, I immediately thought of my sister. She and her husband and two girls love to camp...and they have a new addition on the way! So I made this for her (surprise, Sarah! Ha ha!!). I used the Darling Dots paper and added some soft white ribbon. 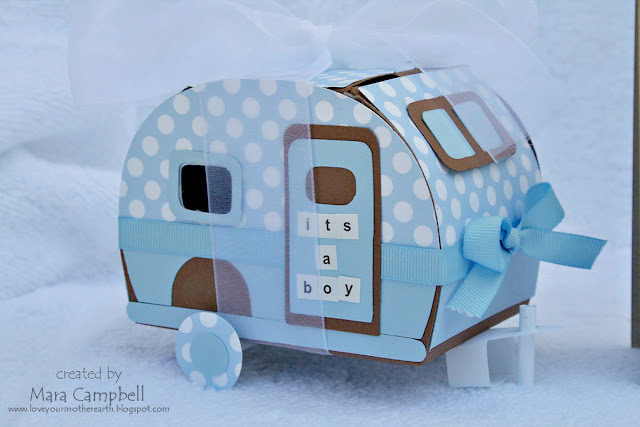 And this little camper even opens!! You can add some sweet chocolates or sweet baby booties to the inside. 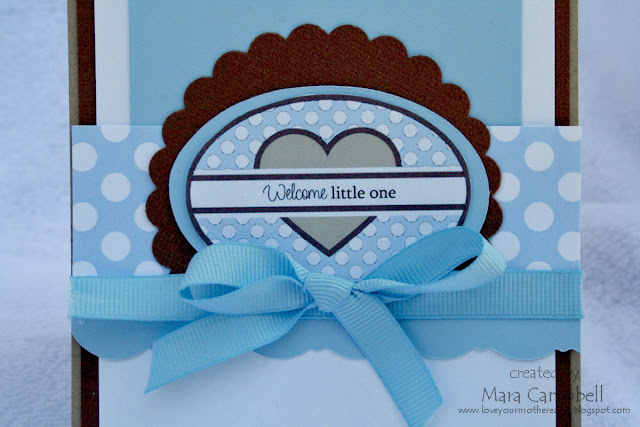 I made a matching baby card using the Fine Finish cut files and the Round Off stamp set. I find myself coming back to these 2 products over and over and over again!! I also used the Elegance Border Builders to create the fancy border. Please take some time to check out everybody's projects today!!! And this is just the beginning! I will be back over the next few days with some really fun new templates, papers, and MTME projects!! Thanks for stopping by today! My kids love to read. I love to read, too. I swear, I never would have made it through my ankle surgery recovery without my Kindle!! One of our favorite things to do when we are camping is open all the windows in the camper and just relax and read. I used the Coconut Lime Soup papers from Jillibean Soup again. I love these papers, they are so versatile. I also tried splattering paint on my layout. Nevermind the paint that got on my shirt and all over the table when I did this, I like the messy look! And I had to use the mason jars, they were just too cute to pass up! And butterflies...I still *heart* butterflies! 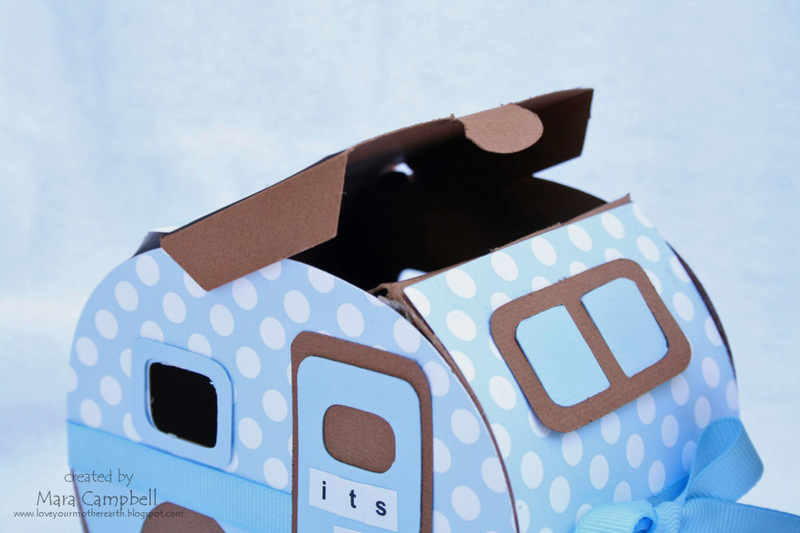 This layout makes me wish we had a camping trip in our future! We aren't taking any big vacations this summer, due to my husband getting a new job and not having any vacation time yet. But we will get back to camping and the ocean breeze soon!! 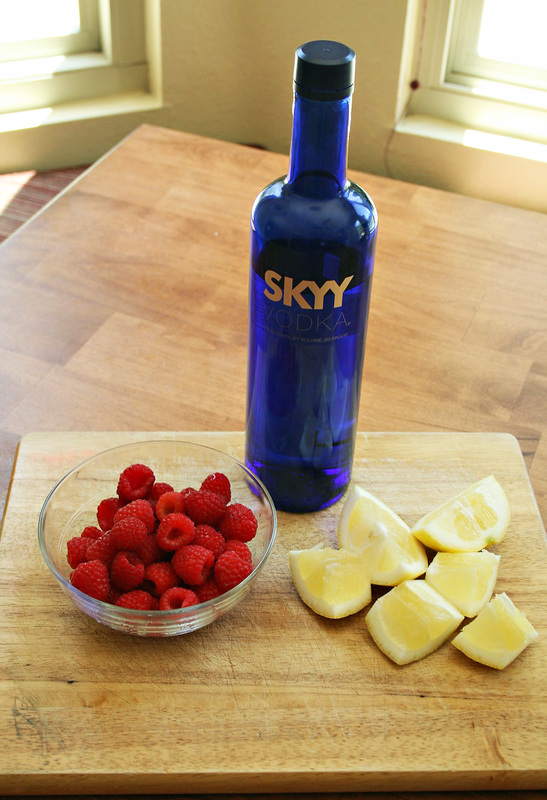 Combine 1 cup of sugar with 6 oz of fresh raspberries. 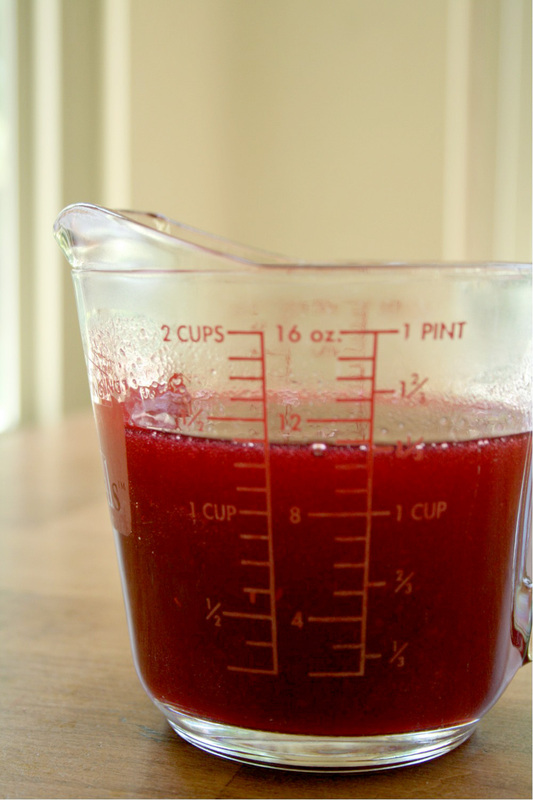 Heat in a saucepan over medium heat until the berries dissolve and liquify, stirring frequently. Pass the liquid through a fine mesh sieve to remove all the seeds. You end up with this beautiful raspberry simple sugar. -Fill a martini shaker to the top with ice. Shake, shake, shake! 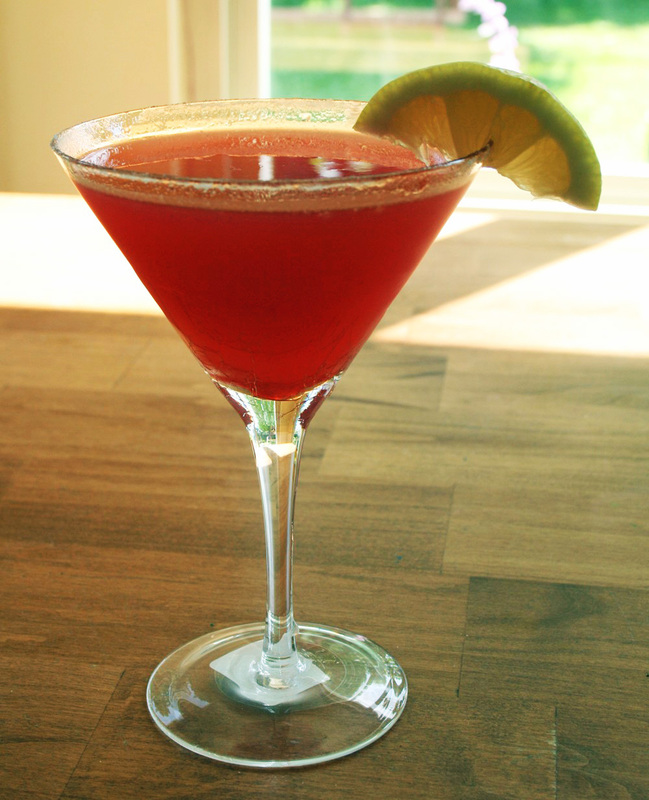 Wet the rim of the martini glass using a lemon wedge, then add fine sugar to the rim. Pour your shaken martini into your sugared glass. Enjoy!! I loved this martini. It was just enough sweet and just enough sour and just pretty amazing. I bet it would be delicious with other types of berries as well. I can't wait to experiment more! Thanks for stopping by today!! Cheers! Happy Saturday!! I just wanted to pop in quickly and let you know that My Time Made Easy is having a sale this weekend...25% everything!! 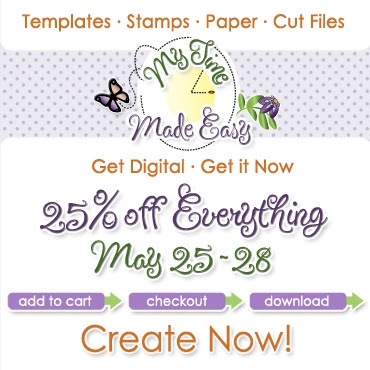 If you have ever wanted to try the great templates and cut files, now is your chance! 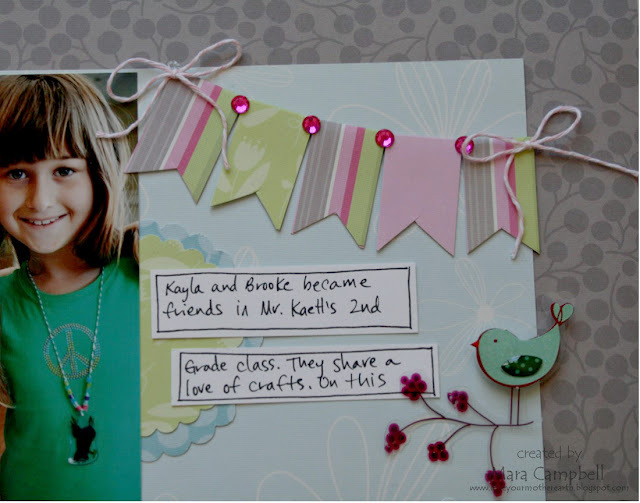 The templates come in all formats so it doesn't matter if you have a Cricut or a Silhouette or another cutting machine. Lauren offers the templates in all file formats. 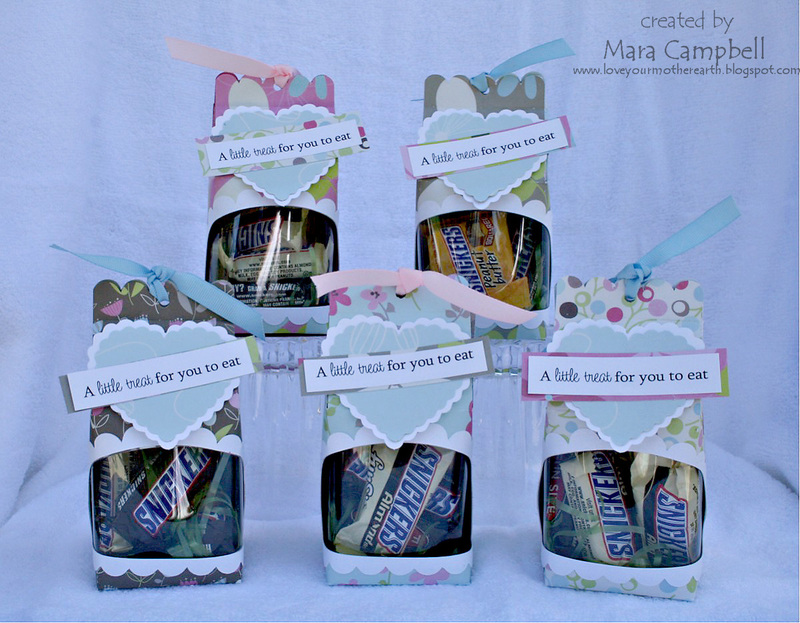 The Tricky Treat Tote...a great gift bag. Com-pleatly Versatile...the boxes that come with this template are the easiest I've ever worked with. Well Contained...a great treat holder! Fine Finish Tags...you get 7 tag cut files for only $1.88. That is a STEAL!! I use these over and over and over!! 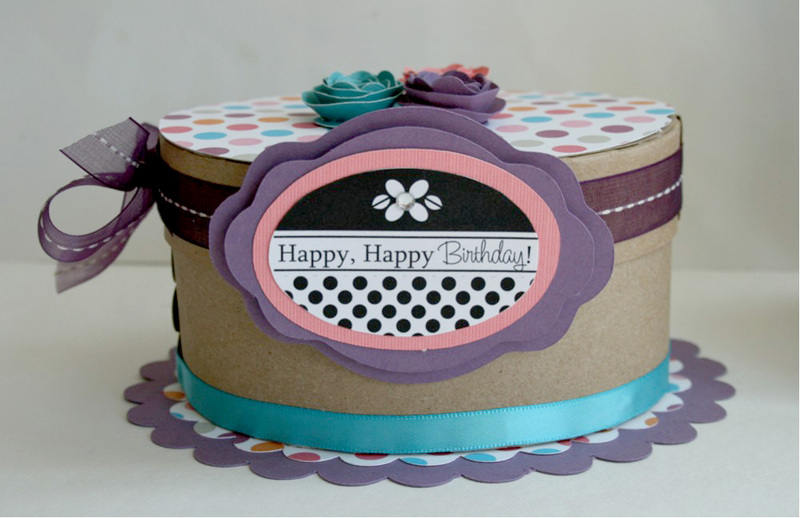 I made the label and all the layers for the Round and Round template with the fine finish tags. I love them. I hope you all have a wonderful weekend!!! I will be back Monday with some new projects. Thanks for stopping by today Friends!! Happy Friday!! And even better, happy Friday before a 3-day weekend!! Do you have big plans for the weekend? Are you going to hit the beach? As much as I love the beach, I try to avoid it on Memorial Day weekend since it's so crazy. But I will share a beach photo of my beautiful girl. She loves the beach and everything about it. I used the Coconut Lime collection from Jillibean Soup for this one. The yellow background is perfect for my sunshine-y layout. 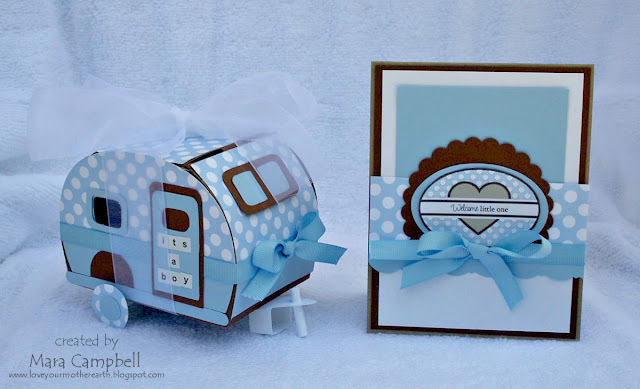 The more time constrained I am for making layouts, the more I appreciate all the matching die cuts and embellies that Jillibean includes with their collections. I made some flags using toothpicks (which will probably never be used for food, just craft projects in this house!!) and dug out some old Queen and Company felt to add to the layout. Maybe if I'm lucky, I can sneak in some crafting time during my 3-day weekend. I hope you have a fabulous Memorial Day weekend, everyone!! Thanks for stopping by today! These bars have been on my to-bake list for a while. Thankfully they also were on the to-bake list of one of my baking buddies so at our last 'baking night' we tackled these together. 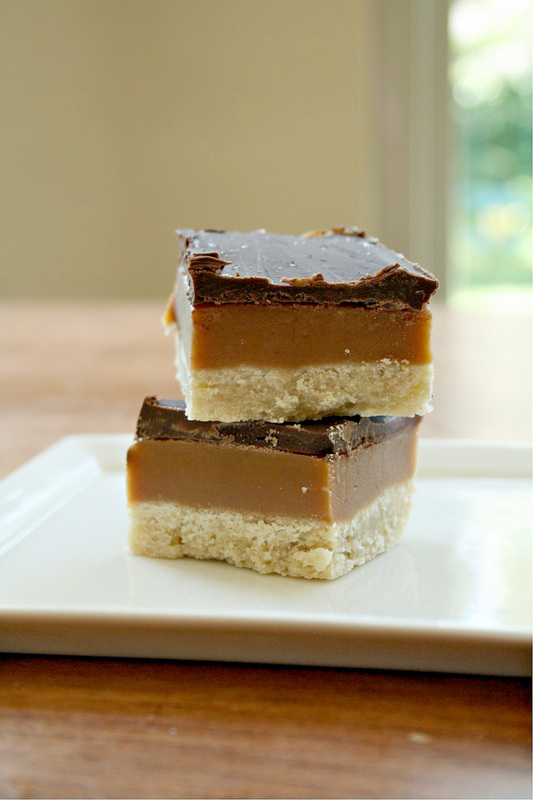 These have a shortbread-like bottom, a thick caramel layer, and a beautiful chocolate layer on top. They are a bit different from Twix bars, because they are not all the way dipped in chocolate. But we were okay with that. These were so good with that thick layer of caramel!! I am glad we finally tackled this recipe, it's definitely a keeper. Make a pan of these for your Memorial Day Weekend, you won't be disappointed. 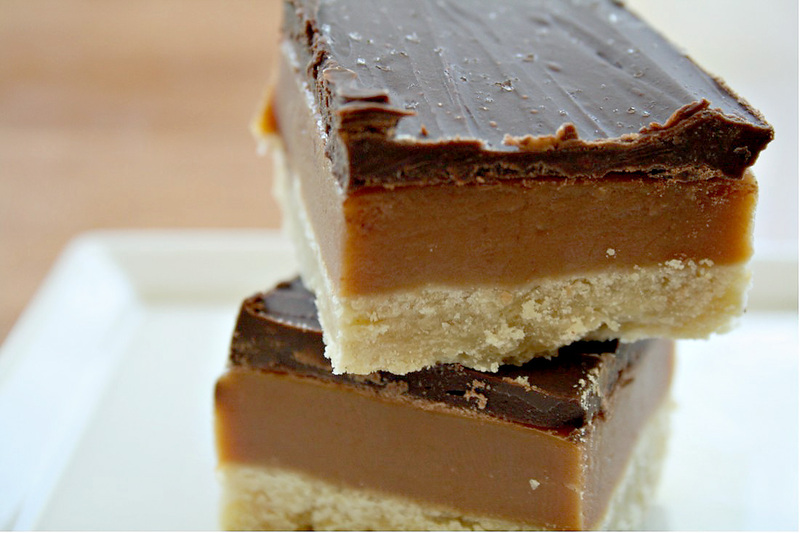 Please go here to find the recipe: Homemade Twix Bars. It's no secret that I love Jillibean Soup. Their collections always call out to me and the Coconut Lime Soup collection was no exception. 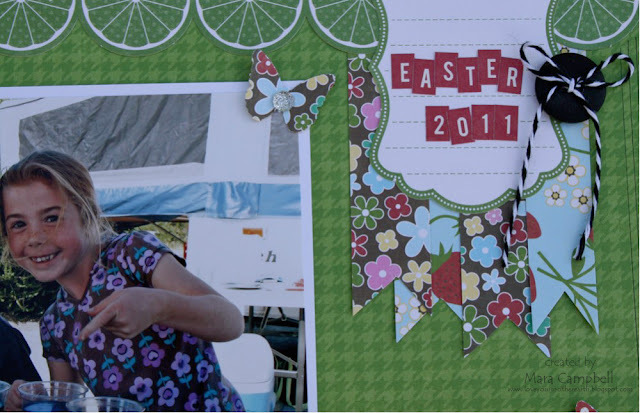 I love the bright summery colors and thought they were perfect for scrapping the photos I have of the kids coloring Easter eggs. 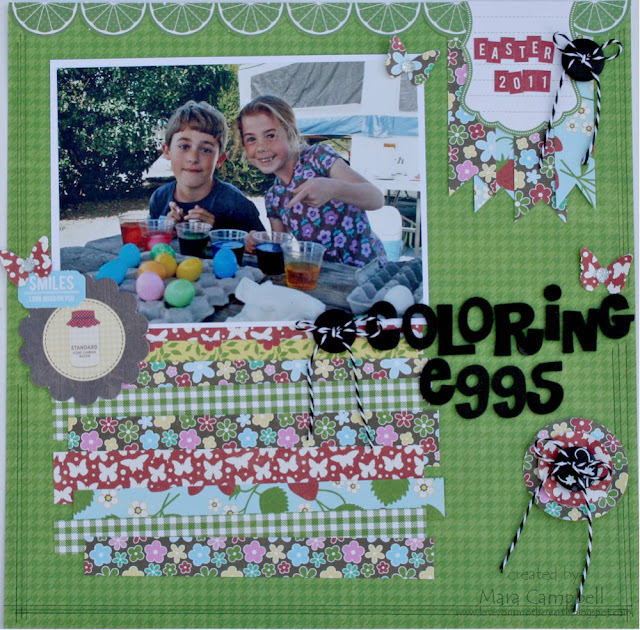 I don't do well with pastels and enjoyed working with this brighter colors for an Easter layout. I went bold with a green background and then added lots of layers from there. I loved using the lime border and added some pennants in the upper corner. I don't know who started the pennant craze, but I'd like to personally thank them!! My current favorite thing to do with baker's twine is to leave the tails of my bows all long and dangly. Such fun using this collection!! That's all I have today...thanks for stopping by and have a great Tuesday! Happy Sunday! I hope you are all having a good weekend. I am excited that today is our big reveal for our card kit club. Beth sent us all some pretty sweet goodies this month and I went a little bit crazy making cards. I hope you are ready for lots of photos!! Here is a photo of all the goodies she sent. Look at all the sweet strawberries!! Here is my first card. 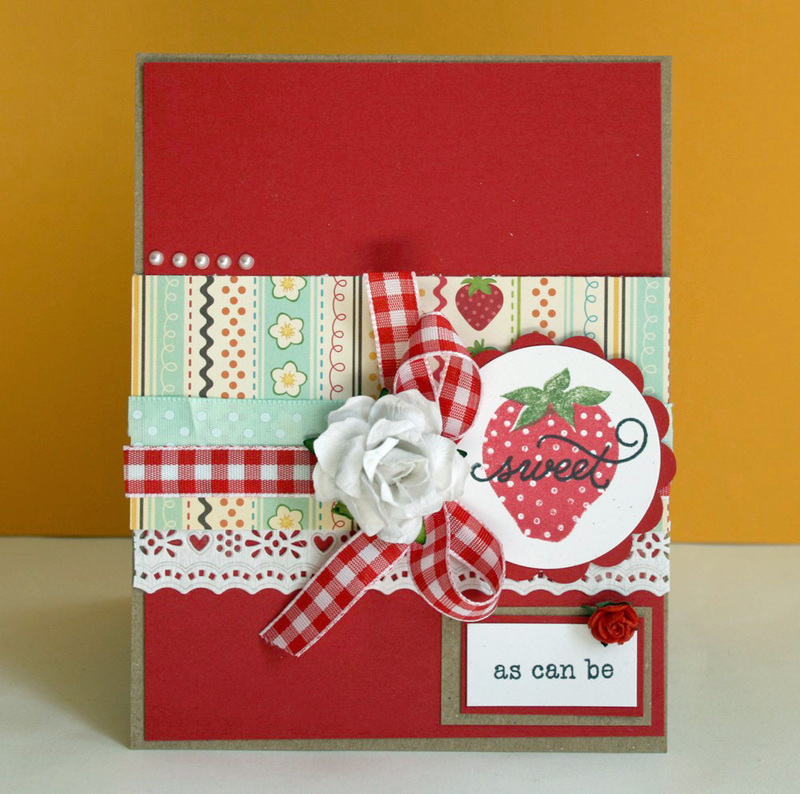 I love the stamped strawberry with the sentiment, the pretty gingham ribbon and that big beautiful rose!! 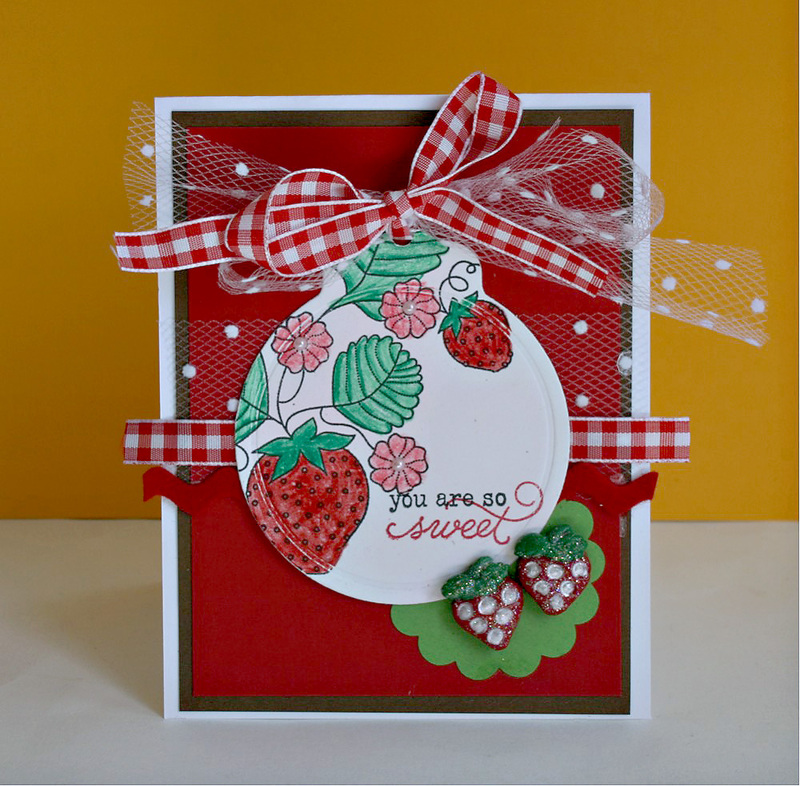 I stayed with the kraft and red combo and made card #2. I fell in LOVE with this polka dotted tulle that was in the kit. So pretty!! 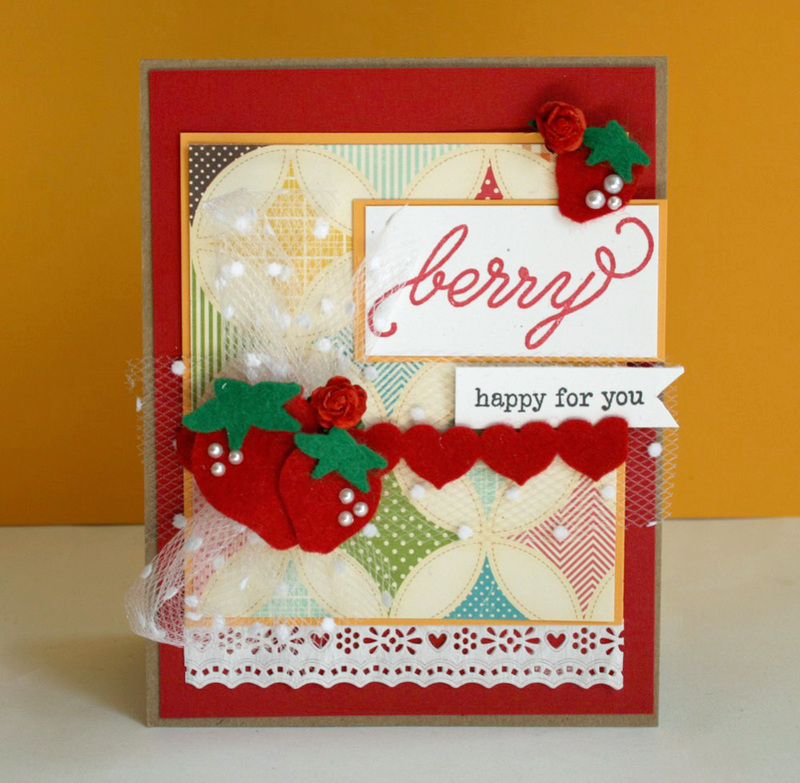 Beth cut some felt strawberries for the kit and I layered them with some pretty pearls and a pretty red rose. And a bit tulle bow! Are you still with me??? Because I have one more card to share! I had to try coloring that big stamped tag that was in the kit. I'm still not good at coloring, but I'm pretty good at these big double bows! And look at these great strawberry clay buttons. Her daughter made them especially for the kit. I had so much fun creating with this kit. Thanks, Beth for all the great goodies!!! And thanks for sitting through all my photos. Please go check out the other girls and what they did with the kit. 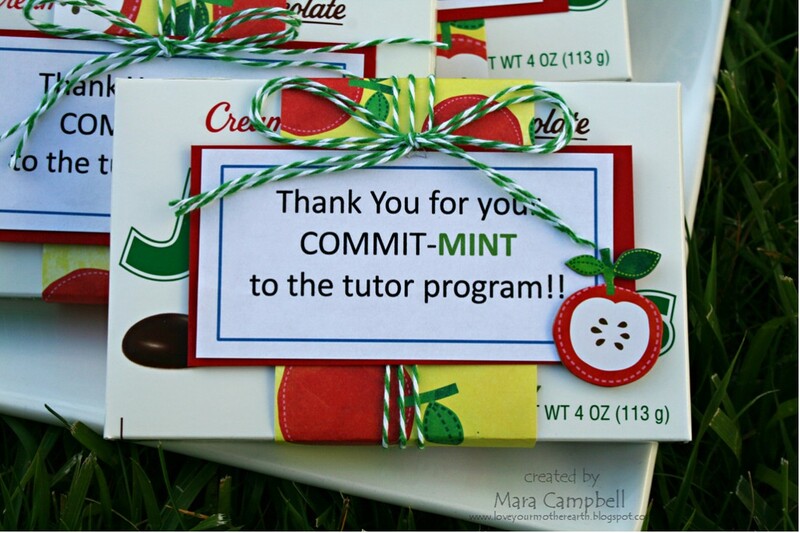 My son, who is in 4th grade, was part of a tutor program at his school this year. The program paired a 4th or 5th grade student with a 1st grader to help improve their reading skills. My son really bonded with the boy he was tutoring, it was a great experience for him. The program was run by 3 parent volunteers, who gave up so much time to run this program. The kids had to be at school 30 minutes early every day and there was always a parent volunteer present. Today is the tutor party and I made these for my son to give to the parents who run the program. This was a ridiculously easy gift to put together. The boxes of Junior Mints were $1 at Target (yes, i'm a big spender). 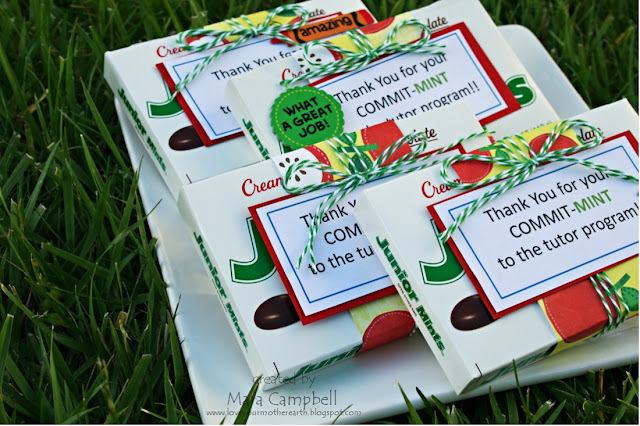 I wrapped them in school themed paper, printed the sentiment on the computer and tied it up with some twine. I found the sentiment idea on Pinterest when I searched 'teacher appreciation gifts'. There are so many great ideas out there! Reeses Pieces: You are a great teacher, We love you to pieces! Lifesavers: Thanks for being a Lifesaver! 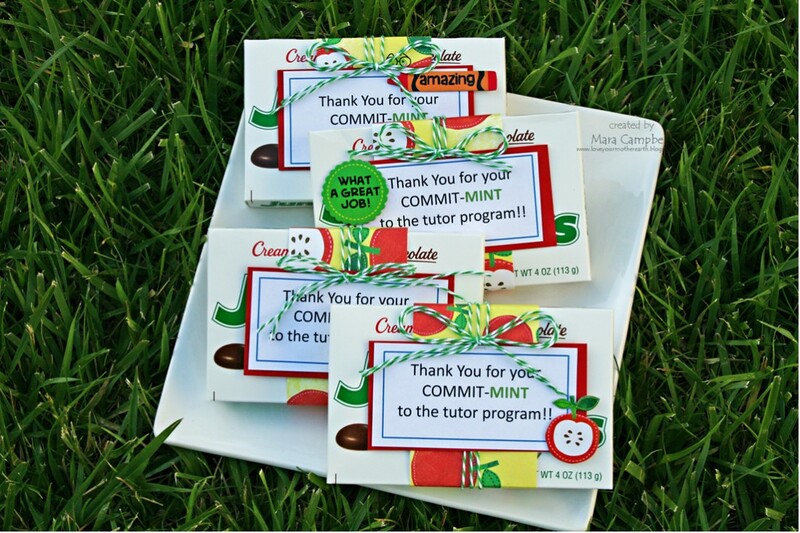 Skor Bar: We Skored having you for a teacher this year! 100Grand Bar: You are worth more than 100 Grand! What other ideas can you come up with? With the end of school right around the corner, I will definitely be making more of these. They are super easy and fast to put together, great for when your kid tells you 8 hours before they need it. Ha ha!! Happy Friday and thanks for stopping by today! 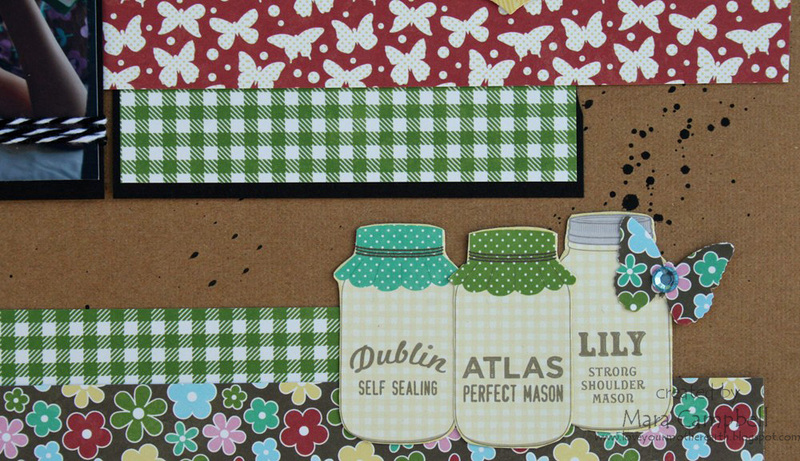 I was very excited to get some new Jillibean Soup papers in the mail right before my scrap retreat. The Neopolitan Bean Bisque collection and the Coconut Lime Soup collections were the first papers I packed in my scrap bag. 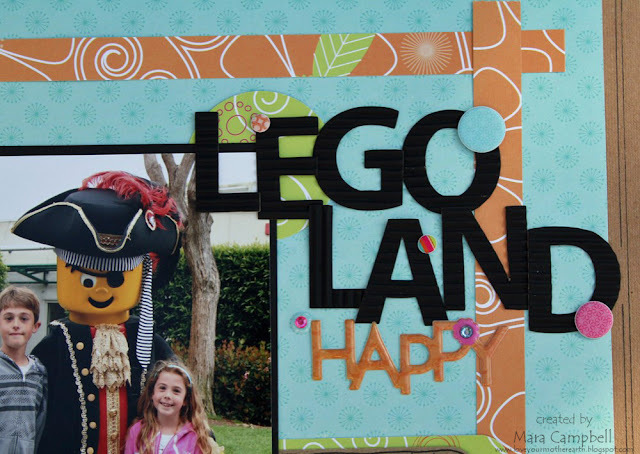 I used the Neopolitan Bean collection for this layout...and yes it's another Legoland layout! At the time we went, my son was really into Bionicles and he loved seeing all these larger than life bionicles. 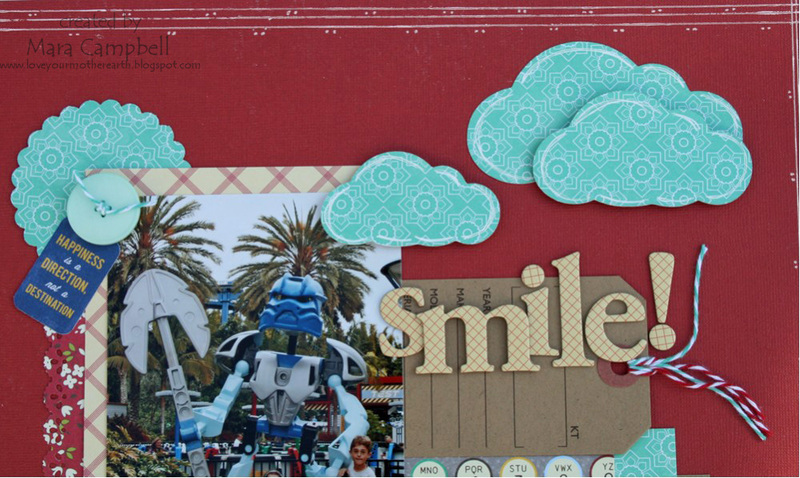 I layered lots of fun Jillibean papers, added some clouds cut on the Cricut, a Jillibean tag and some buttons. One fun thing (and maybe the ONLY fun thing) about packing for a scrap retreat is I actually go through ALL my scrap stuff and find hidden treasures. 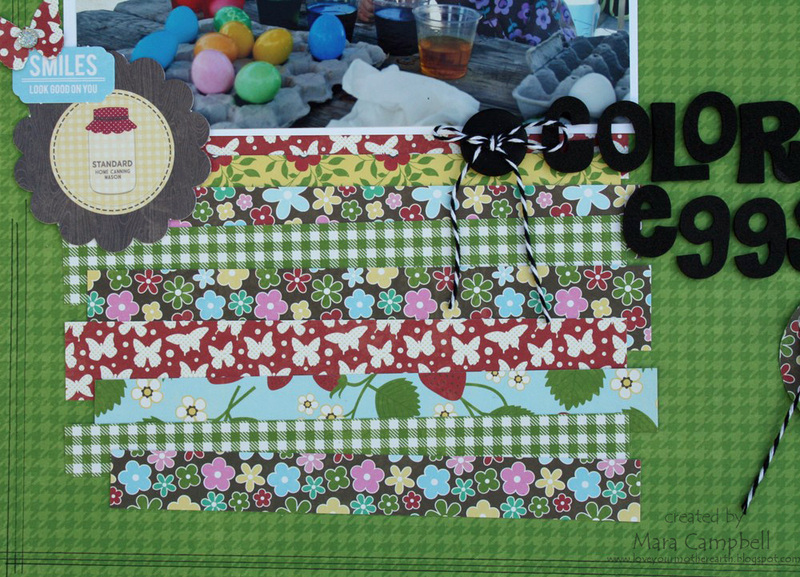 I found these fun hatched Thickers that went perfectly with my layout. I love that. And I found some fun bling, too!! I am digging the colors of these papers, I like the aqua and oranges together. I'm sure these papers will be popping up on more layouts in the future! Happy Thursday and thanks for stopping by today! I am finally getting around to scrapping our spring break trip...from last year. I am not crazy enough to think I can actually stay 'caught-up' with scrapping all my photos. I actually took a break for making layouts because it just wansn't doing it for me. 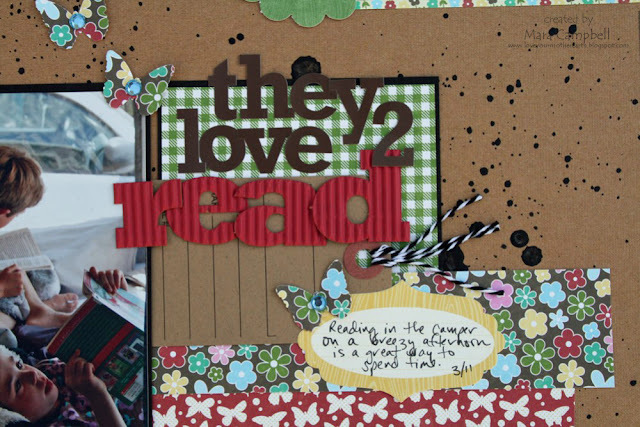 But I am happy to report that making layouts is FUN again. Wheeee!!! I used the Kaleidoscope pyramid paper pack by Momenta. I just love all the colors in this pack, I have used the heck out of it and I still have more paper. Pretty much everything is Momenta...the paper, the alphabet letters, the title, and these fun confetti stickers. I am so happy to be making a dent in my spring break photos. We camped at Carlsbad State Beach for a week and had so much fun. 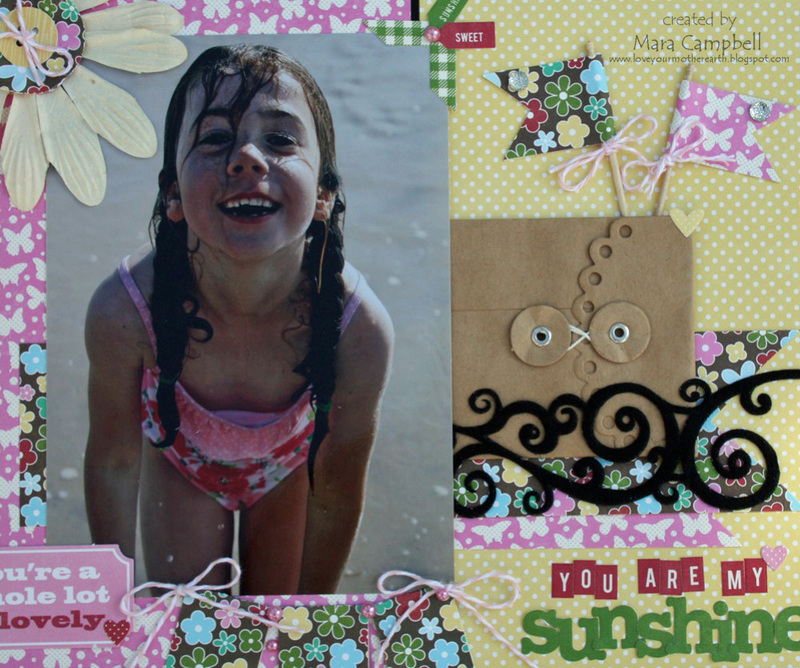 I will be sharing more spring break layouts soon!! Happy Monday!! I hope all you mom's out there had a wonderful day yesterday. Mine was very low key...a homeade breakfast, an afternoon bike ride and lots of reading and relaxing inbetween. And now...Monday again! I think Mother's Day should be a 3-day weekend. I'm sharing another She-Art girl today. 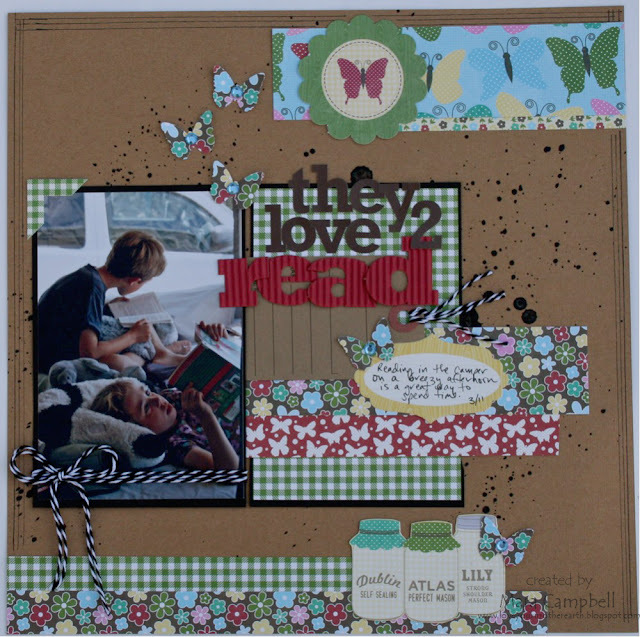 For this one, I closely followed Christy's video where she showed how to make a scene with your She-Art girl. I started with some blue paper for the sky, green toned papers for the grass and then covered most of the paper with paint. I built up the scene from there. I think her neck is definitely better than the other She-Art girl I shared. And I tried the pleated/layered skirt technique. I used paint for my flowers and used quite a few rub-ons on this canvas. I love my white rub-ons, I just wish I wasn't running low. I will be on the look out for more white rub-ons for sure. I made this for a friend of mine who is an animal lover. 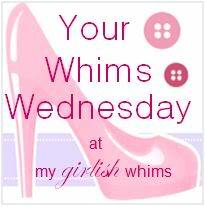 I love the quote, thanks to my bloggy friend Joni! She helped me come up with a saying that fit for her. And as I type this, I have two more canvases coming to me via fed-ex and some other paint and supplies. I can't wait to make another Girl!! Thanks for stopping by today, friends. Have a great Monday! Our lemon tree right now is going crazy. We have more lemons than we know what to do with. I put them in my water and my daughter has made homeade lemonade a few times. I even brought a big bag to work to share with co-workers. And I still have lemons! 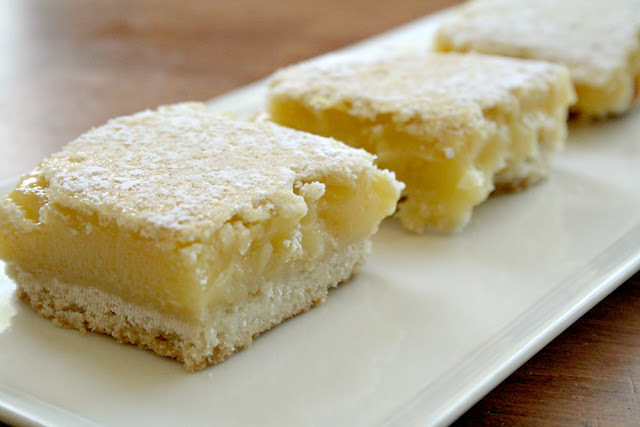 So when life gives you lemons...make lemon bars. 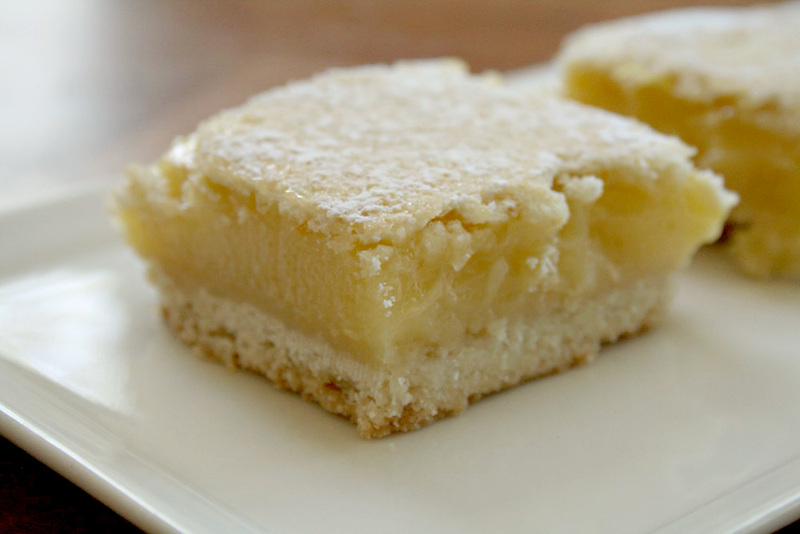 I love the big thick layer of lemon in this recipe. Except for squeezing all the lemons to get their juice, this is a pretty easy and quick recipe! A light dusting of powdered sugar finishes them off. Hope you are all having a great weekend. Thanks for stopping by! Happy Friday!!! It's been one heck of a week. My daughter and I went horseback riding on Wednesday with her girl scout troop and she ended up getting kicked in the leg by one of the horses. Wednesday night was spent at urgent care getting xrays, because the way it swelled up I thought it was broken. Good news, no broken bones!! But man, did that make this mama's heart hurt to see that happen. Her leg just needs some rest and ice and elevation and then it will be as good as new. I hope. Here is a layout I did for Momenta of my daughter and one of her friends...who didn't get kicked in the leg by a horse on Wednesday. Ha ha! I am in love with the Chloe's Garden patterned paper pad. I chose a darker, more neutral paper for the background. And then started adding Momenta embellishments!! I used some great puffy border stickers and 3-d layered clear stickers. All the alphas are Momenta, as well. I love these layered clear stickers!! Isn't that birdie super cute? I also cut my own banner and added some baker's twine and gems to finish it off. I am really getting back into making layouts again. I made quite a few on my scrap weekend and I can't wait to share them! I hope you have a Fabulous Friday! Thanks for stopping by. I have been going on scrap weekends with the same group of girlfriends for the last 6 years. We often play Secret Sisters over the weekend. This is just like having a Secret Santa over the holidays. You get one girl randomly assigned to you and you leave gifts for them all weekend. Then on the last night, we have the big reveal/gift exchange. I love this because it's always so fun to personalize gifts. And since we have a rough 'budget' for the weekend, I also like to try to be thrifty and make as many gifts as I can. This past weekend was no exception. My secret sister liked costume jewelry and I wanted to give her a place to showcase her necklaces. This cabinet door has been in my garage for almost a year. A good friend of mine gave it to me and I had planned to make it into a chalkboard menu for my kitchen. But I never got around to it! So I decided to turn it into a jewelry board. 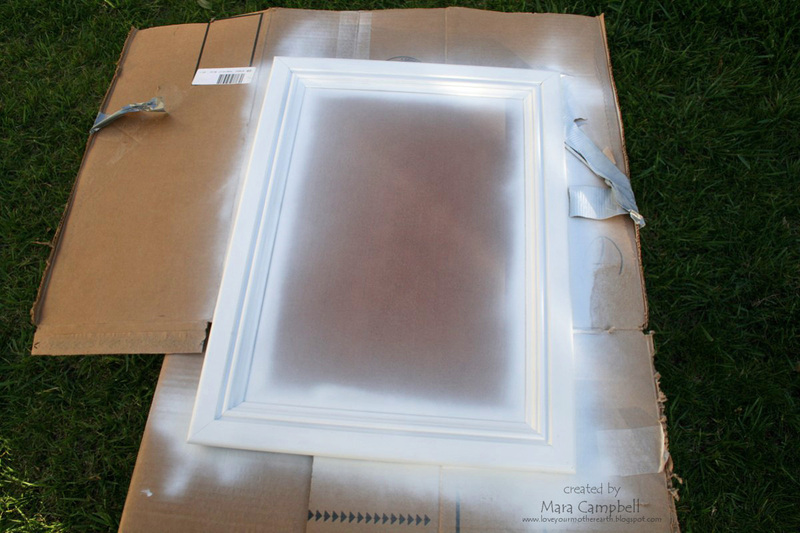 The first thing I did was spray paint it white. I didn't bother to cover the face of the door, since I was planning on covering that with patterned paper. 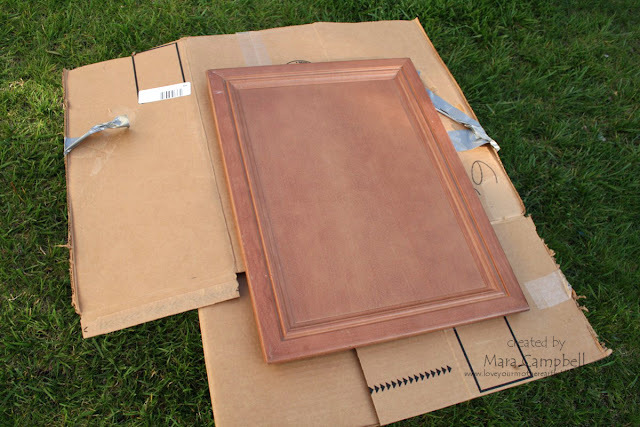 It took a couple of coats of spray paint to cover the brown wood completely. The hardest part was deciding what paper to use in the middle. I agonized for weeks over this! I wanted it to match her master bathroom/closet and I had to go on advice of friends who had actually been in her master bathroom. I used coordinating paper from the Momenta Chloe's Garden paper pack. I mod podged it right to the face of the cabinet door. My husband drilled 3 holes and I added 3 drawer knobs. 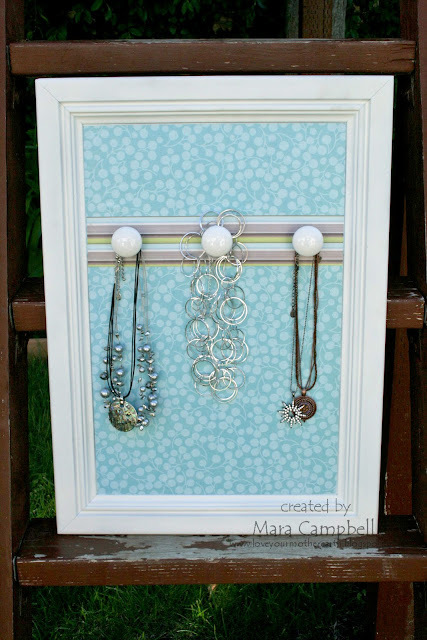 This will be where she hangs her jewelry. And that's it!! After deciding what paper to use, it all came together very quickly. 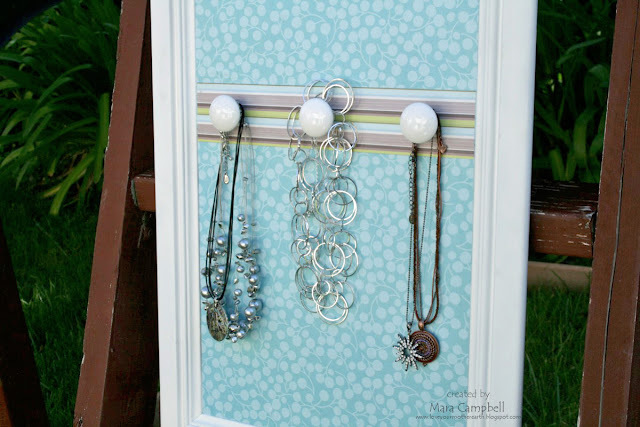 I love that the jewelry will add lots of visual interest and texture to the board. And it won't matter if she has long necklaces that hang off the end, especially if it's mounted to a wall. Overall, I'm really happy how it turned out. It's something fun and unique and it was very inexpensive to create. 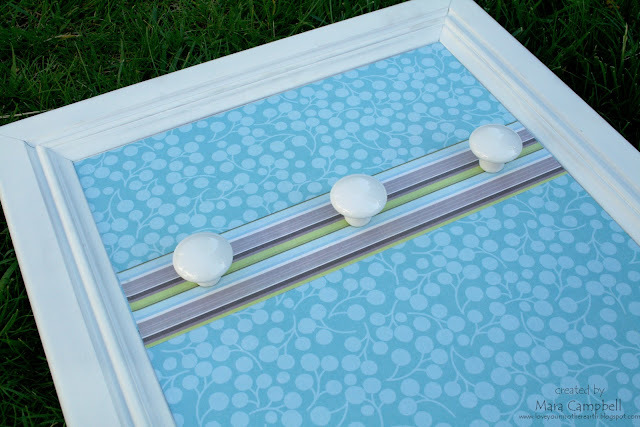 I already had the spray paint and the paper, and the knobs were about $3. Now I am on the lookout for another cabinet door because I want to make one for myself!! 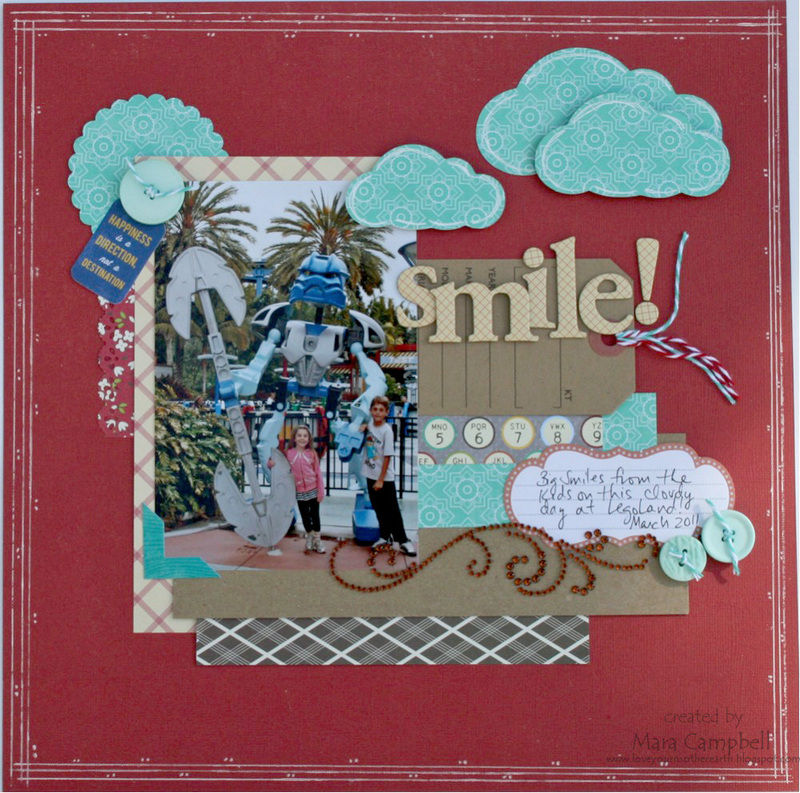 Blooming Wonderful Ideas-MTME Release Day!